Neo for Iwata Series airbrushes are designed to deliver soft, effortless coverage at low air pressures, making them an easy choice for many types of spray applications. The Neo CN Gravity-Feed Dual-Action Airbrush has a detachable 0.24 oz / 7 ml fluid cup with lid that is large enough for colour mixing and an additional 0.05 oz / 1.5 ml colour cup that is ideal when using small amounts of spray medium. The airbrush will also hold a small amount of paint without a cup attached, which is ideal for paint touch-ups when only a tiny amount of paint is needed. 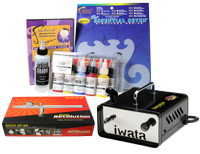 Read information on Iwata 5 Ways to Spray: An easier way to understand Airbrushes. 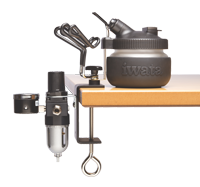 From extreme detail spraying to maximum coverage, we classify Iwata airbrushes into five categories so you can easily find the perfect airbrush to cover your specific needs for any project.